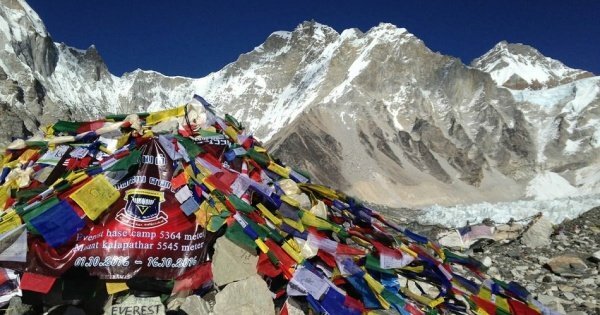 The Everest Base Camp Trek is one of the most popular trekking destinations among trekkers who opt for an incredible trekking experience while enjoying the regions natural splendour. Your amazing tour will start by our guide picking you up from your hotel at 6 am and take you to the airport for a panoramic flight to Lukla, where your Everest Base Camp Trek will begin. Your journey will take you through remarkable rhododendron and pine forests. Enjoy the flora and fauna as you visit Sherpa villages and Buddhist Monasteries as you trek in the majestic Himalayas. Your climb up to Kalapather and the breathtaking view of Mt. Everest will leave you with lasting memories that you will treasure forever. Today you will enjoy an early morning flight with panoramic views to Lukla with your trekking crew. You will have some time to see Lukla and enjoy its beauty and your Everest Base Camp trek will begin from here as you walk from Lukla to Phakding. From Phakding, after crossing the Dudh-koshi suspension bridge, the walk is easy and pleasant with short uphill and downhill climbs. You will re-cross the same river again and have a magnificent view of Thermasarkhu which is 6,608 meters from the village of Benkar. This day is reserved for acclimatization and exploring the area. Namche Bazaar is a good place to shop with magnificent views. The first half of the walk is fairly simple and easy. You can reach the top of Namche Bazaar after a walk of 20 minutes. After a pleasant walk of 2 hours, you come to a small place at Shanasa. After a strenuous walk from here for an hour, you will reach the religious Buddhist entrance which lies just before Tengboche. After you have relaxed for the day, you begin your trek towards Dingboche. The path goes through a forest that has trees like birch, juniper, fir, and rhododendron. Dingboche is a lovely green place and this greenery is spread all around the village and where you will find farms and crop- fields all around. The natives here grow crops like barley, buckwheat and potatoes. You can go for a short walk around the village or trek to Chukung, which is a 3 to 5 hours trek and at a height of 4,730 meters. From Dingboche, the trail diverts towards the north, and the path is gradual and easy for the first 40 – 50 minutes. After this easy walk, you will come to a mani- prayer stupa. From here another 3 hours of strenuous trekking time brings you to Lobuche. Today will be an exciting day for you as you are very close to your final destination (Everest Base Camp Trek). Today you will have an adventurous journey and a great trekking experience. The trek to Everest Base Camp can be misleading compared to the high- altitude trekking and strenuous climbs of your tour. Everest Base Camp is a lively place during the high expedition season. After you have trekked to Everest Base Camp and returned back to Gorakshep and an overnight stay in Guesthouses, you are now ready to climb up to Kalapatthar. Everest from this point looks closer than you could imagine. From here you will trek back to Pheriche. You have done the Everest base camp trek. From this day onward, you will have pleasant and easy walks throughout as you will be continuing downwards to lower elevations. The trek from Namche Bazaar to Phakding is again a simple and easy walk. After this easy walk, you will reach Lukla. Again on your flight back to Kathmandu, you will have magnanimous views of your surroundings. Consider yourself lucky if you manage to get a window seat as it will take about 45 minutes to reach Kathmandu. Transfer you to your hotel in Kathmandu for overnight. The company will offer you farewell dinner in a typical Nepali restaurant.